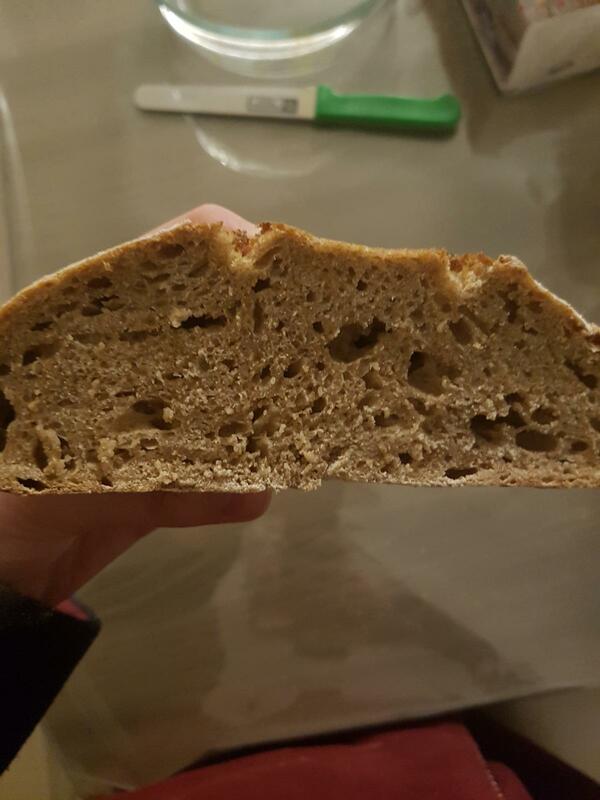 I had made a higher hydration WW loaf and it had little rise and great honeycomb. I lowered the hydration expecting less honecomb for sure, but here, there's very little openness between the major holes. I can't tell whether it's a bulk fermentation or a proofing issue. What are your thoughts on this? Looks a bit gummy with large air bubbles dispersed in a tight crumb elsewhere. Like you've described. I think this points to under fermented. How do we tell the difference between underfermented and underproofed? Proofing is the result of the fermentation. Bulk ferment is done for flavour and a good matrix of air bubbles in the dough. Proofing is allowing the dough to rest for enough time, after shaping, for a controlled but maximised oven spring. This is done when the dough has reached the "optimal" rising for the flour being used. A dough that is over proofed may not necessarily be over fermented as it can be knocked back, re-shaped and proofed again as long as there is life in the dough. Because proofing (rising after shaping) is the result of fermentation it's not exactly the same thing. Or the purpose is not exactly the same. Often in the bulk ferment the dough is proofed beyond the optimal stage - for baking. It's then shaped a proofed. Often but not always. One of the giveaway signs of under proofing is large gaping holes dispersed within a tight crumb. While the gaping holes in the bread aren't too bad the crumb matrix looks under developed. Sometimes if the bulk ferment is done well but then the dough is under proofed then you can get runaway oven spring. In proofing you're adding some more tension so you get that increased oven spring. That is clear for me. However, when looking at the result of the bake, I find it difficult to identify whether it was under/over fermented or under/over proofed. So let's say if it is underfermented it lacks bubbles? But how do we identify if it is over fermented? Because you'd get a lot of bubbles, but then you shape, you get some rise, they get somewhat distributed... does the bread not get as much oven spring if it got over fermented? I'd agree that underproofing would leave bigger wholes dispersed within a tight crumb, potentially even closer to the crust. Over proofing I believe would mean colapsed wholes, gummy texture in the crumb and denser at the bottom? Last but not the least, the dough still ferments while proofing, right? At least I see it like that. I do understand there is more to that stage than fermenting, but I have difficulty considering fermentation has truly stopped. There are people on here far more experienced than I am so I hope they chime in. Under and the matrix of bubbles is lacking and/or uneven (this can also be due to shaping issues). Over fermented and you might still get a lot of air bubbles but it'll be flat (also a sign of over proofing). So you see where issues can be confused or misinterpreted. I'm sure there'd be some level of disagreement in trying to interpret on crumb only. I see under fermented as I know with my own experience where I've gone wrong and have gotten pretty much the same results. But a lack of oven spring might point to other things as well. The dough still ferments at the proofing stage. Proofing is the result of fermenting. The dough ferments, creates air bubbles and rise. Trick is to get the bulk ferment and final proofing done before the game is up, i.e. before the food runs out.